The RECKONERS series finale is — for better or for worse — very much the typical Brandon Sanderson novel. Longtime fans will be fairly familiar at this point with the steps we take in Calamity, from meticulous build-up to carefully situated hints to action-packed confrontation to final twist. It may feel a little safe for that reason — Sanderson definitely doesn’t try to break any new ground here — but it’s meant to be a fun YA novel more than anything else, and on that level it succeeds. It’s a good book, a successful conclusion to the series, and will satisfy the vast majority of its readership. If you liked the first two RECKONERS novels, you should go out and buy this one. No? Still need more convincing? Well, then. In this, our third and final installment in the RECKONERS series, our hero David and his team (comprised of: Megan, David’s girlfriend and newly reformed supervillain; Abraham, weapons specialist and brooding type; Cody, comic relief; and Mizzy, antidote to a potential sausage-fest) are on the hunt for their erstwhile commander, Jonathan Phaedrus (aka Prof, aka Limelight) who gave in to his Epic powers and went cuckoo for cocoa puffs at the end of the previous novel. Prof is still following the evil scheme of now-deceased mastermind Regalia, and the Reckoners are determined to stop him. With the revelation that Epics can be rehabilitated, the team is desperate to save Prof from himself, but as the stakes grow ever higher they begin to fear that their only option may be to kill him before he can achieve his final ambitions. Meanwhile, David — that specialist at insane plans — begins to hatch his most bonkers scheme yet: to take the fight directly to the source of Epic powers in a final showdown with the godlike being called Calamity. Sanderson has always been a fantastic craftsman of plot and pacing. He has an almost superhuman ability to keep the reader reading, paired with that single quality that truly enervates the work of such an author: his plots work. They’re well-considered, well-executed, and hang together almost perfectly. Watching a Sanderson book come together — especially in a final book in a series like this one — is like witnessing the workings of an intricate and exquisitely functioning machine. One wonders how any human being could be that clean and assured. Calamity is no exception, tying everything up in a neat, crisp bow. And to be honest, I’m not sure how I feel about that. In some ways, I’m the typical entitled reader in that I’ve grown used to Sanderson’s immaculate denouements and have begun to yearn for something more raw despite all the technical skill on display. There’s something noticeably calculated (even a little clinical) in the way the story terminates so perfectly. But on the other hand, it’s not a bad ending by any means. It’s consistent with the world-building, it draws David’s story to an appropriate thematic close, and it’s even rather touching. At some point I’d like to see Sanderson break the mold a bit, but at the end of the day it didn’t have to be here. The RECKONERS series, as a whole, has not focused on character so much as fun action, and not a lot changes in Calamity. We get some fun scenes of danger and suspense, with lots of intricate plans and feats of derring-do, but the supporting cast remains fairly flat. Cody is unadulterated comic relief, Abraham is the straight man to keep things grounded, and Mizzy is… still here, for some reason. Honestly, out of all the Reckoners, I find it most difficult to figure out her narrative function. In the last novel, I spitballed that maybe she was intended as a complication to the David/Megan relationship, but there’s no follow-through on that here. My new pet theory is that perhaps Sanderson is grooming her as a new protagonist in case he ever wants to try a spin-off series, but I could be way off-base on that one too. She’s not problematic or intrusive, mind you, just a little baffling. In terms of our main cast, Megan is fine, though her arc feels as though Sanderson had to rush it to fit with everything else going on. Prof spends most of the book mua-ha-ha-ing and contemplating how many innocents he’d like to crush beneath his fascist bootheel today, so there’s not much to speak of from his quarter. David is left to largely carry the narrative, but fortunately he is equal to the challenge. Sanderson wisely focuses on the conflict between idealism and pragmatism that enervates David into something more than just the charismatic goofball he otherwise threatens to become. I did notice some issues with dialogue in this installment, so readers with a sensitive “ear” for that sort of thing might want to take note that the occasional phrase (from David in particular) can tend to feel oddly formal. There’s a particular section of the book (roughly 30-50% on my e-reader) where it’s more noticeable, after which the situation improves. Back in the pluses column, though, fans of superheroes will find a lot to enjoy here, as Sanderson makes this final book into his love letter to the American superhero as a figure. He understands as so few authors do that superheroes are not really defined by their abilities and circumstances so much as by their (often grandiose) emotions, and this enables him to slip in some interesting commentary on the genre without sacrificing any of his narrative urgency. Sanderson is far from the first to try out the “what if Superman was evil?” idea, but where similar works have situated themselves as the mature versions of a childish story, Sanderson is outspoken in denying and in fact reversing this paradigm. In so doing, he drags his superheroes out of postmodernism and back into the optimism of classic science fiction. Some readers (especially those who will cheer for Batman rather than Superman at next month’s film) may find the ideas a little heavy-handed, but personally I appreciated them. Overall, Calamity is a fun and engaging conclusion to the RECKONERS series. Sanderson makes no serious missteps, and works the novel to its finale with his usual efficiency. Fans of superheroes and the previous novels should find a lot to enjoy. Published on February 16, 2016. 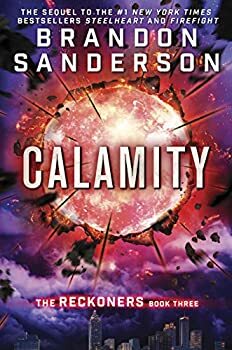 From the bestselling author of the Mistborn series and Words of Radiance comes Calamity, the final book in the New York Times bestselling Reckoners series. What started in the instant #1 New York Times bestseller Steelheart and continued in the instant #1 New York Times bestseller Firefight now concludes in Calamity. When Calamity lit up the sky, the Epics were born. David’s fate has been tied to their villainy ever since that historic night. Steelheart killed his father. Firefight stole his heart. And now Regalia has turned his closest ally into a dangerous enemy. David knew Prof’s secret, and kept it even when Prof struggled to control the effects of his Epic powers. But facing Obliteration in Babilar was too much. Once the Reckoners’ leader, Prof has now embraced his Epic destiny. He’s disappeared into those murky shadows of menace Epics are infamous for the world over, and everyone knows there’s no turning back. . . . But everyone is wrong. Redemption is possible for Epics—Megan proved it. They’re not lost. Not completely. And David is just about crazy enough to face down the most powerful High Epic of all to get his friend back. Or die trying.